Trump Administration Doubles Worksite Investigations To Combat Illegal Immigration : The Two-Way The administration has plans to greatly expand investigations and audits of businesses suspected of employing illegal immigrants. 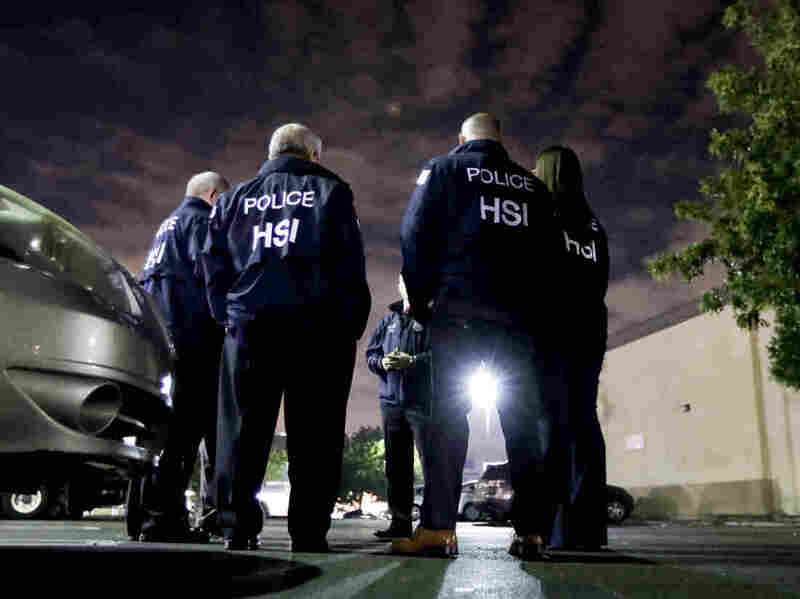 U.S. Immigration and Customs Enforcement agents gather before serving a employment audit notice at a 7-Eleven convenience store in Los Angeles in January. The Trump administration announced Monday that it has dramatically increased the number of worksite investigations and audits to make sure that American businesses do not employ people who are in the U.S. illegally. Immigration officials say they have launched more than 3,500 worksite investigations, already doubling the number of cases compared to the previous fiscal year. Similarly, 2,282 employer audits were conducted between Oct. 1 and May 4 (with five months remaining in FY18). Over the course of last fiscal year, only 1,360 audits were launched. "An audit is a review of business records," said Immigration and Customs Enforcement spokesperson Danielle Bennet. "An investigation can include an audit and is conducted because of suspicion that the law in being violated and can result in criminal charges and/or civil fines." A 1986 federal law requires employers to verify that their employees are legally authorized to work here. Employers have to document the eligibility of their hires using Form I-9. In a statement, U.S. Immigration and Customs Enforcement said it is working to ensure that American businesses maintain "a culture of compliance." "Our worksite enforcement strategy continues to focus on the criminal prosecution of employers who knowingly break the law, and the use of I-9 audits and civil fines to encourage compliance with the law," said Acting Executive Associate Director for Homeland Security Investigations, Derek N. Benner. "HSI's worksite enforcement investigators help combat worker exploitation, illegal wages, child labor and other illegal practices." Thus far, 594 employers have been arrested for criminal violations of the immigration law, that's four times the number of arrests last fiscal year. According to the Associated Press, ICE plans to ramp up its audit campaign this summer. "Derek Benner, head of ICE's Homeland Security Investigations unit, told The Associated Press that another nationwide wave of audits planned this summer would push the total 'well over' 5,000 by Sept 30. ICE audits peaked at 3,127 in 2013. "The agency has developed a plan to open as many as 15,000 audits a year, subject to funding and support for the plan from other areas of the administration, Benner said. "The proposal calls for creation of an Employer Compliance Inspection Center to perform employer audits at a single location instead of at regional offices around the country, Benner said. Electronically scanning the documents will help flag suspicious activity, and the most egregious cases will be farmed out to regional offices for more investigation. Audit notices will be served electronically or by certified mail, instead of in person." The ICE statement says that in FY17, "businesses were ordered to pay $97.6 million in judicial forfeitures, fines and restitution, and $7.8 million in civil fines."